Were Hedge Funds Right About AstraZeneca plc (AZN)? Before we spend days researching a stock idea we’d like to take a look at how hedge funds and billionaire investors recently traded that stock. S&P 500 Index ETF (SPY) lost 13.5% in the fourth quarter. Seven out of 11 industry groups in the S&P 500 Index were down more than 20% from their 52-week highs at the trough of the stock market crash. The average return of a randomly picked stock in the index was even worse. This means you (or a monkey throwing a dart) have less than an even chance of beating the market by randomly picking a stock. On the other hand, the top 15 most popular S&P 500 stocks among hedge funds not only recouped their Q4 losses but also outperformed the index by more than 3 percentage points. In this article, we will take a look at what hedge funds think about AstraZeneca plc (NYSE:AZN). AstraZeneca plc (NYSE:AZN) was in 21 hedge funds’ portfolios at the end of December. 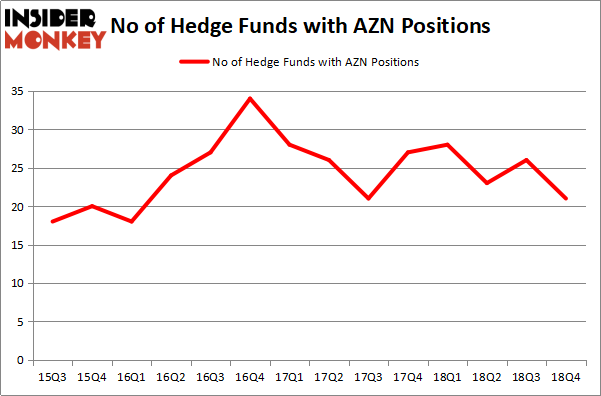 AZN has seen a decrease in activity from the world’s largest hedge funds recently. There were 26 hedge funds in our database with AZN positions at the end of the previous quarter. Our calculations also showed that AZN isn’t among the 30 most popular stocks among hedge funds. To the average investor there are dozens of tools stock traders employ to size up publicly traded companies. Some of the less utilized tools are hedge fund and insider trading sentiment. Our experts have shown that, historically, those who follow the best picks of the elite investment managers can outpace the market by a solid amount (see the details here). 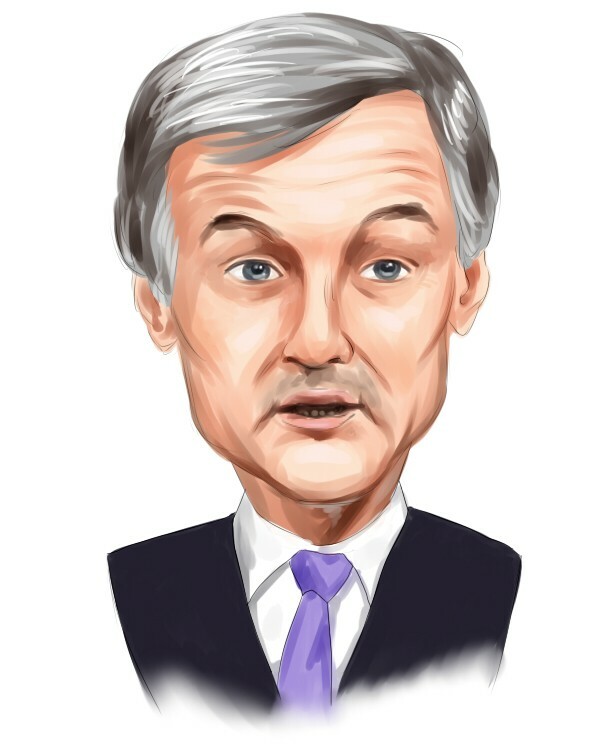 Let’s analyze the new hedge fund action surrounding AstraZeneca plc (NYSE:AZN). How have hedgies been trading AstraZeneca plc (NYSE:AZN)? At Q4’s end, a total of 21 of the hedge funds tracked by Insider Monkey were long this stock, a change of -19% from the previous quarter. Below, you can check out the change in hedge fund sentiment towards AZN over the last 14 quarters. So, let’s find out which hedge funds were among the top holders of the stock and which hedge funds were making big moves. More specifically, Fisher Asset Management was the largest shareholder of AstraZeneca plc (NYSE:AZN), with a stake worth $568.4 million reported as of the end of September. Trailing Fisher Asset Management was Arrowstreet Capital, which amassed a stake valued at $444.6 million. Farallon Capital, York Capital Management, and Millennium Management were also very fond of the stock, giving the stock large weights in their portfolios. Seeing as AstraZeneca plc (NYSE:AZN) has faced bearish sentiment from the aggregate hedge fund industry, we can see that there were a few money managers that elected to cut their positions entirely heading into Q3. Interestingly, Dmitry Balyasny’s Balyasny Asset Management dumped the largest investment of the 700 funds tracked by Insider Monkey, comprising an estimated $15.8 million in stock, and Ori Hershkovitz’s Nexthera Capital was right behind this move, as the fund cut about $7.6 million worth. These moves are interesting, as total hedge fund interest fell by 5 funds heading into Q3. Let’s now take a look at hedge fund activity in other stocks – not necessarily in the same industry as AstraZeneca plc (NYSE:AZN) but similarly valued. These stocks are GlaxoSmithKline plc (NYSE:GSK), Accenture Plc (NYSE:ACN), HDFC Bank Limited (NYSE:HDB), and Altria Group Inc (NYSE:MO). This group of stocks’ market values match AZN’s market value. As you can see these stocks had an average of 31.5 hedge funds with bullish positions and the average amount invested in these stocks was $1150 million. That figure was $1348 million in AZN’s case. Altria Group Inc (NYSE:MO) is the most popular stock in this table. On the other hand GlaxoSmithKline plc (NYSE:GSK) is the least popular one with only 23 bullish hedge fund positions. Compared to these stocks AstraZeneca plc (NYSE:AZN) is even less popular than GSK. Our calculations showed that top 15 most popular stocks among hedge funds returned 19.7% through March 15th and outperformed the S&P 500 ETF (SPY) by 6.6 percentage points. Hedge funds were also right about betting on AstraZeneca as the stock returned 14.5% and outperformed the market as well. Do Hedge Funds Love Taiwan Semiconductor Mfg. Co. Ltd. (TSM)? Were Hedge Funds Right About Merck & Co., Inc. (MRK)? Here is What Hedge Funds Think About Cisco Systems, Inc. (CSCO) Should You Buy The Boeing Company (BA)? Were Hedge Funds Right About The Coca-Cola Company (KO)? Were Hedge Funds Right About Novartis AG (NVS)?